In our last Moon Mail, we took a look at Chapter IX of Homer’s Odysseyand compared it’s themes to its rulership (Zeus and/or Jupiter), and the sign that it ruled (Sagittarius). Using a code that relies to a large extent on imagery and repetition, we began to observe a number of related characteristics that emerge through the chapter, especially in the comparative and or superlative departments. My daddy is bigger than your daddy. Or words to that effect. The plants are overgrown or enormous. The enemy and clouds are massed for battle. The race (the Cyclops) they encounter are bigger than that of normal men. But there was another clue in the image that we used that was there for the picking, but I totally missed it. It was a revelation that demonstrates the difference between mathematically induced celestial deductions and the observational astronomy used by ancient star gazers. It was another of those‘A-ha! !’ moments that hit right between the eyes. The depiction we used last time was of a great ram with Odysseus roped in underneath. As anyone who has read the Dragon book knows, many of the themes of mythology represented those of a shifting sky picture, with each civilization attempting to catch a stellar snapshot of their moment in time. 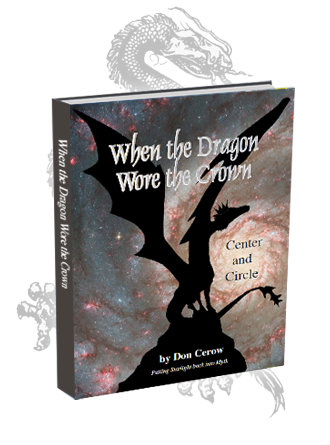 The book,When the Dragon Wore the Crown, has a secondary title, Center and Circle. It’s premise is that these mythological cultures, anyone who was using the sky to help erect a calendar, needed a vocabulary in order to talk about the precise motions of heaven. It turns out that they generated a pictorial vocabulary. Center and Circle follows the Creation Myths of various cultures around the globe. We observed that the Center was often designated as either theTree of Life (marking the North Celestial Pole), or of the Dragon (as the constellation Draco protecting his treasure, the Pearl). Without accurate observations of heaven’s high point, all other celestial calculations are off. Without an accurate Center there is no accurate Circle, and without the Circle all stellar calculations are off. This is the Dragon (snake if you prefer), in the TREE. Ancient ceremonies on New Year’s day were orchestrated by the priesthood, not to stab a lizard, but to determine the exact position of the North Celestial Pole which, because of precession, moves a little each year and must be re-checked with each New Year’s. The Circle marks the circle (or more accurately, ellipse) of the zodiac. Spring is where the ecliptic is being sliced and designates the current position of the Vernal Equinox. From about 6,000 BC down to the present this ‘slice’ has cut out pieces of the constellations Gemini, Taurus, Aries and, most recently, Pisces. Center and Circle. Tree and Ram. Sam I am. Homer was thought to have written the Odyssey sometime around 800 BC. Visually speaking, that would be about mid-constellation, Vernal Equinox wise. First of all, look at the path of the ecliptic on the astronomical map. It’s the dotted line that begins in the lower right and moves up towards the tail of the Ram. Secondly, look at the position of Odysseus on the vase beneath the Ram. He is our hero, running along beneath the constellation of the Ram. Thirdly, note the tree in the background. Finally, look just below the fingertips on the hand of our hero. There are seven slashes, as if calibrations on a scale, with his hand ready to make a mark. 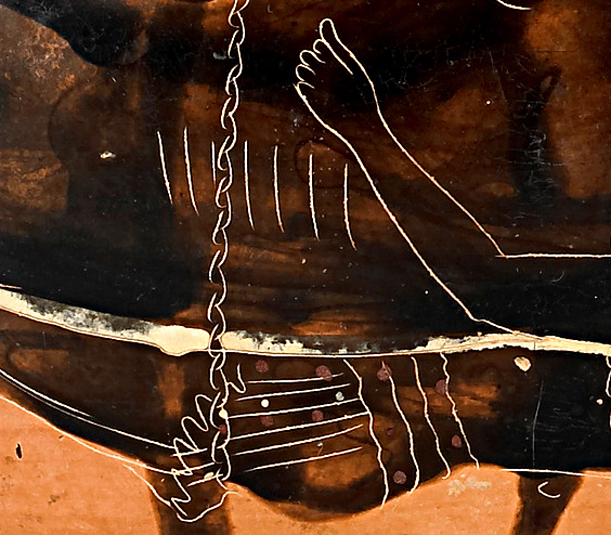 The wavy line is one of the three ropes that holds Odysseus in place beneath the Ram. The slashes mark the period of time during which the mythological quest was current and offers minor adjustments for the centuries right around 800 to 1200 BC. 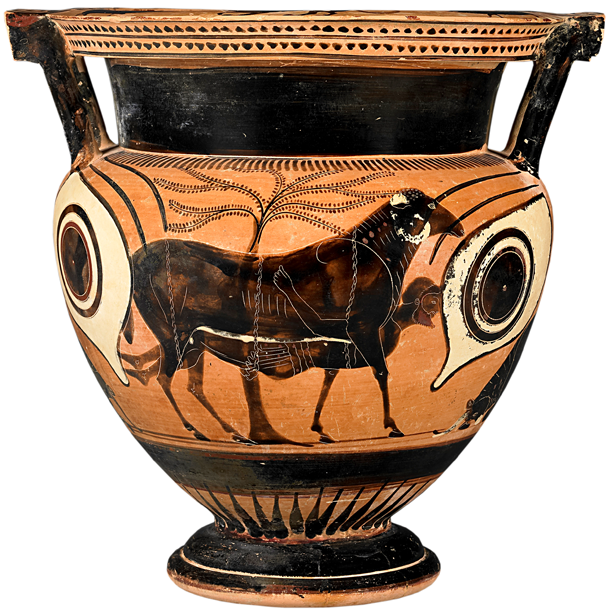 The eyes on either side of the Ram are telling you to look at this instant in time, on the vase, in the sky. Odysseus is the man of the moment, our Solar Hero. This is (or was) where he was currently at. I want to know how come his feet are pointed up, toward the sky, while his head looks forward, facing the direction in which he is heading. He must do a lot of yoga.